Josh Arichibald and Sean Maguire were sent to Arizona in exchange for Michael Leighton to help out WBS. This trade likely won’t register as either helping or hurting Pittsburgh. It is important for WBS to find success on the ice. Lately that has not happened. WBS has relied on their strength in goal all season. When DeSmith and Jarry were both called up to Pittsburgh, WBS went 2-3-1 . Since getting DeSmith back WBS has went 1-1-1. Last weekend, DeSmith played on back to back nights and was pulled after letting 4 goals in. Playing DeSmith every night the rest of the season simply isn’t an option. The outlook is even bleaker if Jarry or DeSmith were to be injured for WBS. As a result, WBS has dropped from 1st in the Atlantic Division to 4th in the Atlantic Division. This is unacceptable. Michael Leighton is a fine AHL backup. He has already played 14 AHL games this season for the Chicago Wolfs and Syracuse Crunch. That’s more AHL games played than the tandem of Peters and Steven (who were foisted onto WBS 2 weeks ago) had played in their entire career. Let that sink into your head. He also isn’t constantly injured like Sean Maguire. Leighton has been kicking around the AHL since 2001. Here are three reasons to like, nay love, this guy already…. Here’s a young Michel Leighton going to town with some dude named Cam Ward. Leighton is at it again here going after Jimmy Howard. ….which he lost for the Albany River Rats. As a fan in the crowd that night as a purely neutral observer, I can attest to the fact that that was a brutal game to lose. Could there be anything worse? 3.) 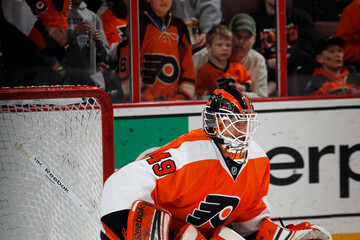 He let in a bad goal for the Flyers that time. By that, I mean he let in a really bad goal for the Flyers that sent the Stanley Cup to the Chicago Blackhawks in Game 6 of the Stanley Cup Final in 2010. Does it get any better? Watching the Flyers lose, is the next best thing to watching the Penguins win. Welcome to the Pens, Leighton. Anyone who takes a Stanley Cup away from the Flyers is a friend in my book.